Bears once roamed these woodlands, help bring them back and save native wildlife for future generations. Bear Wood is an exciting new development due to open in summer 2019. The exhibit will transport you back in time to when the woodland was inhabited by European brown bears, European wolves, Eurasian lynx and wolverine. A walkway will wind through seven and a half acres of woodland where our five European grey wolves will be moved to a new home which they will share with the brown bears. Lynx and wolverine will also roam the woodland as they would have done centuries ago. A ranger station, classroom, interpretation space and café will also be built creating an immersive experience. Bear Wood will show the effects of woodland loss on our native wildlife. It is the story of what was, where we are now and what is still at stake. If you would like to fundraise for the appeal we would love to support you so please get in touch with our development team. 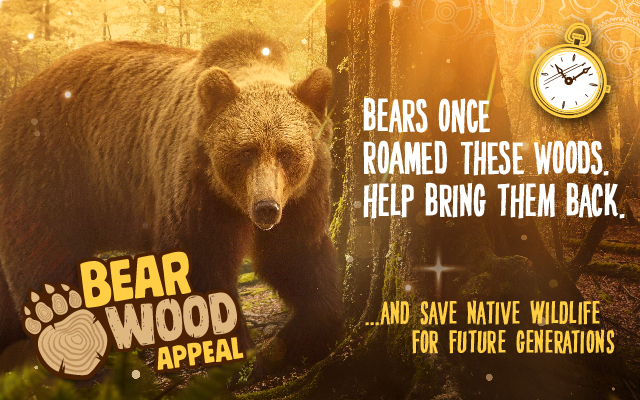 Help secure the future of our woodlands and native wildlife by becoming a Guardian and receive exclusive benefits including life membership, a name plaque in Bear Wood and VIP invitations.